When microwaving a frozen pizza for dinner after a long day at the office, people often multi-task to save time so that laundry can be loaded, dishes washed and the kitchen cleaned. Sometimes, one can forget all about dinner if prioritizing too much, and the result is a relatively unappetizing, cold pizza. Pizzerias experience the same problem when pre-cooking pies in anticipation of a busy day, but heating shelves can make sure that these meals are always piping hot for the customer. The Hatco GRSBF-24-F Glo-Ray Drop In Heated Shelf is a perfect example of such a product. The large surface area can fit easily in the back of most kitchens or display areas, and the coated aluminum top provides easy heating of anything from pizza pies to full trays of meatballs. In the case of a dimmer cooking area, the illuminated dials allow for easy temperature control. 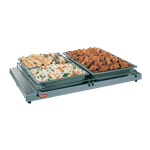 This heating shelf will certainly help customers receive hot food in a timely fashion. With enough of these devices a pizzeria can bake dozens of pies at the beginning of the day and serve them as demand dictates.